Learn Spanish in Cusco, Peru, high up in the Andes Mountains, an area full of Inca heritage and Spanish colonial monuments. Our school in Cusco not only runs excellent Spanish courses, but also organises a wide range of cultural activities and excursions, as well as Volunteer Work. Studying Spanish in Cusco is a very special experience, something truly unique in Latin America, and not to be missed by anyone interested in learning Spanish and in Inca/Latin American culture. Peru has 3 distinct regions - a narrow coastal belt, soaring Andes Mountains, and Amazon rain forests. Cusco, at 11,000 feet is a truly wonderful location in which to learn Spanish, with the Inca heritage, magnificent colonial buildings and Indian markets. Temperatures are cold at night (0ºC-10ºC) and cool during the day (14ºC-22ºC). 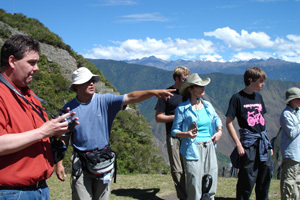 Here you can walk the Inca trail. visit the nearby mystical Lost City of Machu Pichu, trek up the El Misti volcano, or travel to the shores of Lake Titicaca, famous for its floating reed houses. 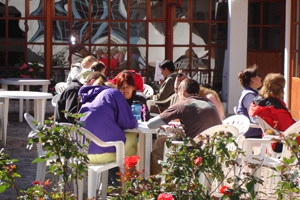 Our school, with 15 classrooms, is centrally located just a short walk from the Plaza de Armas, the main meeting point in Cusco. The host families are exceptionally welcoming and most live within walking distance of the school. Fly to Cusco Airport. Collection service included in the course price.